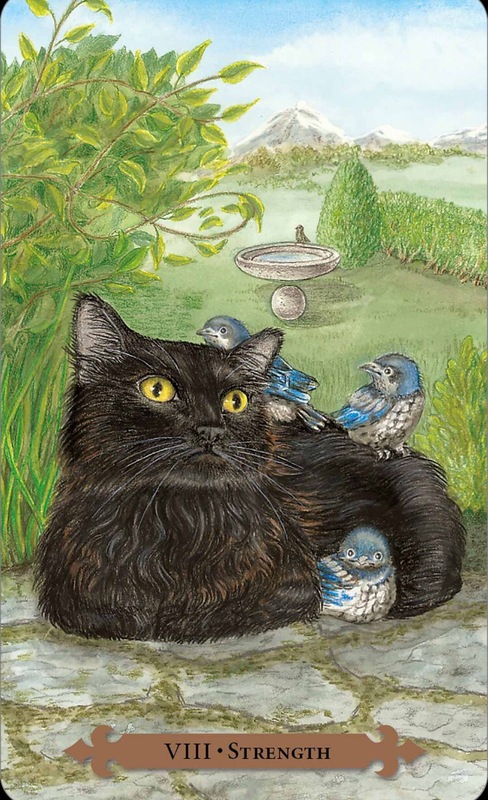 Card: XIV Grace – from The Mystical Cats Tarot by Lunaea Weatherstone. Message from the Faeries: When you look back at stressful events in your life, do you look back at yourself with pride or do you look back filled with regret with way in which you handled yourself? Those moments of regret are moments of measure. Were you respectful? Did you handle yourself with grace? Were you dignified in your actions and behaviour? It is likely those moments that you look back in pride, that you handled yourself well under pressure. Grace is a quality that so very few people are born endowed with. It is a quality that is honed and refined with life experience. Those stressful moments you handled poorly were the teachable moments that have allowed you to refine yourself. One way in which you learn to maintain grace and dignity, is to come to the understanding that there is no point in sweating the small stuff. Another important lesson is learning the temporal nature of existence. Most importantly, it is accepting that you can’t control how other people carry themselves, but you can take responsibility for the way you carry yourself and how react under various circumstances. Of course, you can’t always control how you may react under adversity. However, once you’ve become determined to move through life with some quality of grace, you can observe yourself maneuvering through the world and hold yourself with a bit of pride. As far as we are concerned, there is no shame in having pride in oneself. We love you and we are proud of you. Card: VIII Strength – from the Mystical Cats Tarot by Lunaea Weatherstone. Message from the Faeries: This week is about keeping your integrity, with grace and dignity. You may find yourself in a situation where you are challenged in some sort of way that makes you question your actions, or you may find yourself having to stand up for something you believe in. You will be forced to rely on your strengths to get you through something uncomfortable. Do not shy away from difficult situations. They are the greatest opportunities for you to remember or discover your gifts and talents. They are the perfect moments to demonstrate all of your knowledge and wisdom that you have accumulated over the years. They are the best time to exercise compassion and understanding. This week in particular, we want to focus on grace and dignity. What does grace and dignity feel like and look like to you? Maybe it’s about knowing when to say something and went to just sit and listen. Maybe it’s about knowing when to quietly walk away. Maybe grace and dignity is about not having to right all the time and knowing when to admit to a mistake. It takes great strength to be graceful and to treat everyone in a dignified manner. Strength sometimes requires you to be calm, quiet and collected. Strength can mean being vulnerable so that other people can feel comfortable with their own thoughts and emotions. Great strength is exercised with integrity and with love. Most importantly, your strength comes from being absolutely true to yourself and your values. It’s about doing what’s right, no matter what. Remember that you are strong person and don’t forget who you are. Card: Knight of Swords – from the Fairy Lights Tarot by Lucia Mattioli. Message from Erin: This card is perfect for the upcoming week, for me, as I will be facing many challenges at work. We have recently installed a new computer system at work, which means there is going to be lots chaos as a result of the transfer of data from one system to the next. This brings high stress and hot tempers at work, as we all struggle our way through understanding how the new system works – and what doesn’t work. I asked if this card applies to everyone else, and The Faeries were quite adamant that this card was for everyone else as well. I wonder what they’ll have to say…. 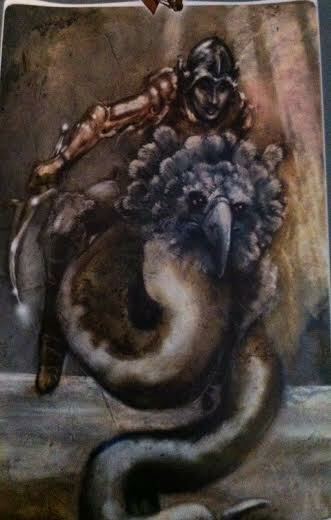 Message from The Faeries: The faerie in this card is charging, full speed ahead, to tackle this issue before him. He doesn’t care what the end result will be. He just knows, deep in his heart, that he needs to do his task at hand. In this particular picture, he is indeed in battle. This battle can be a physical one, a mental one, an emotional one or maybe it’s just something completely made up in his mind. It doesn’t really matter. Any and all conflicts are ultimately battles with yourself. There is no way around it. The reason we chose this card for you this week is because it’s time to stop hiding from your “battles”. No more running away. It’s time for you to face the things that you are hiding from, and we want you to be bold and charge straight ahead. If we looked you in the eyes and told you that there really is nothing to be afraid of, would you believe us? Because this is the truth. There really is nothing to be afraid of. Because you are the creator of your reality, let us ask you this question: Are you afraid of yourself? Really, truly, what is the worse that can possibly happen. For some of you, the thing that you have been avoiding is confronting that person in your life who has been bossing you around, or just not treating you in a respectful manner. If you stand up for yourself to this person, what is the worse that can happen? Any answer that you come up with, we will say to you: Does it really matter? How long have you lived on this planet? Whatever your age, we can tell you that you have enough life experience under your belt to know that nothing really bad is going to happen. We can hear you say: But what if I hurt that person’s feelings? To this we say: What if you do? You aren’t responsible for how that person reacts to what you say. We trust and know that you will defend yourself with honour and dignity. We know that you will use love and compassion. When you stand up for yourself, and you use all these things, we guarantee you that you can do no wrong. Be proud of yourself. Be proud of who you are. Be strong and confident. Stand up for yourself and defend your rights. You have every right to be happy and enjoy your Earthly experience. Don’t let anyone or anything get in your way of accomplishing your dreams and desires. Truthfully, the only thing that is ever really standing in your way is yourself. So be your own knight and charge forward. Everything will fall into place as it should, and everyone will take care of themselves as they will. Honour, dignity, love and compassion.